As a bride to be, we are sure that you have put in long hours to plan that the venue and ambiance of your wedding, suits the mood of celebration. You also may have picked wedding theme colors to ensure that everything looks in sync when your wedding is being video graphed and photographed. It’s usually hard to get your guy to go shopping, but the effort will be worth the results. Wearing the same color means you will stand out in the crowd together. It will be a sight for the guests, and neither you or your partner will feel underwhelmed in the face of such a unified front. If you and your groom plans to wear coordinated outfits we have some pointers to offer. 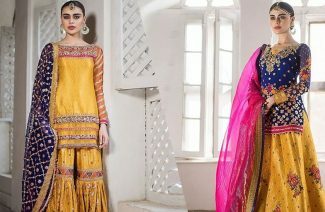 For now, we believe that coordinated outfits are an understated trend in Pakistan, so you have to try it to really know how good it appears. This one is a little tricky to get right. 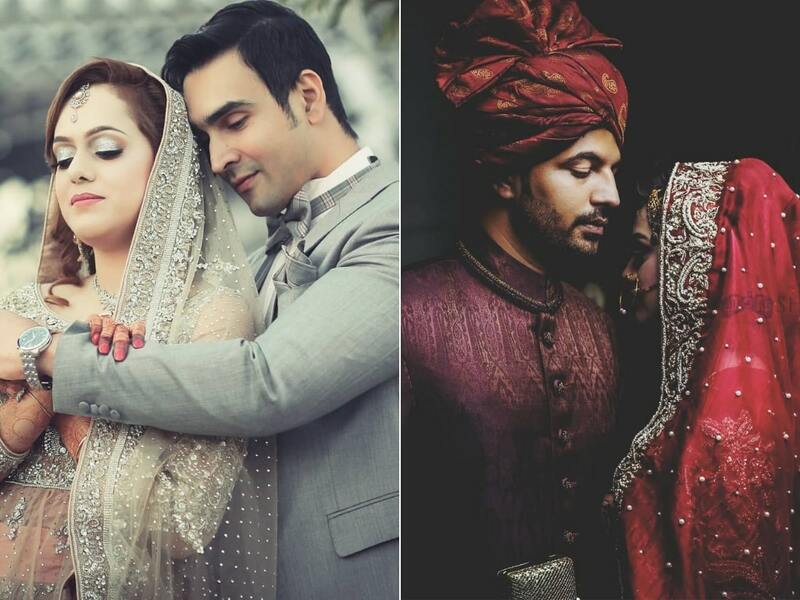 Not all colors have the right unisex aura to look flattering both on bride and groom. Not to mention that there is an element of the complexion of bride and groom that can prove to be conflicting. However, everyone likes harmony, and if you wish to wear the same color you should opt for colors like white, gold, teal, indigo, baby pink, mint green and dark or powder blue etc. They will look great on both of you. You can pick individual styles for the garment and opt for different textures and motifs to avoid too much mixup. You don’t wish to be same wearing outfits. 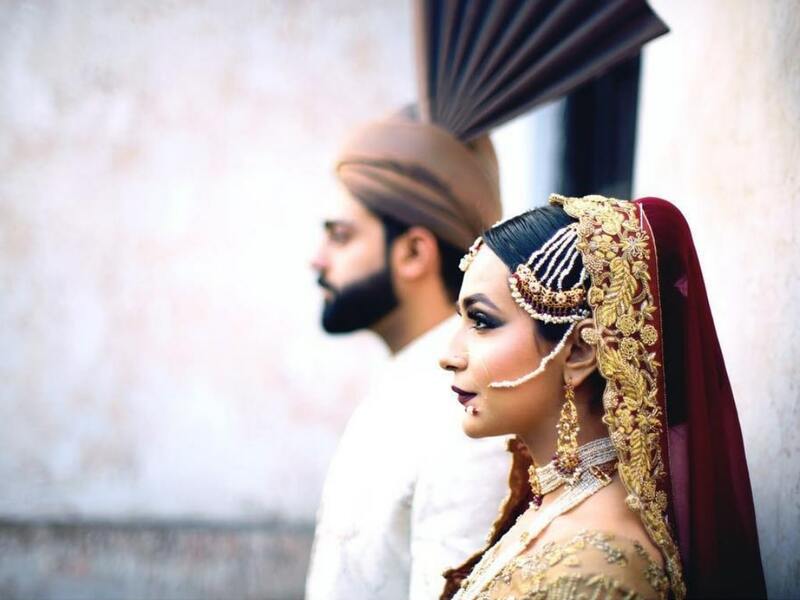 Another way to go about this is for groom to incorporate bride’s lehenga color into his accessories like a tie, pocket square, waistcoat, shawl or turban. It will not look great without diminishing the effect of the bride and groom’s individual dress. 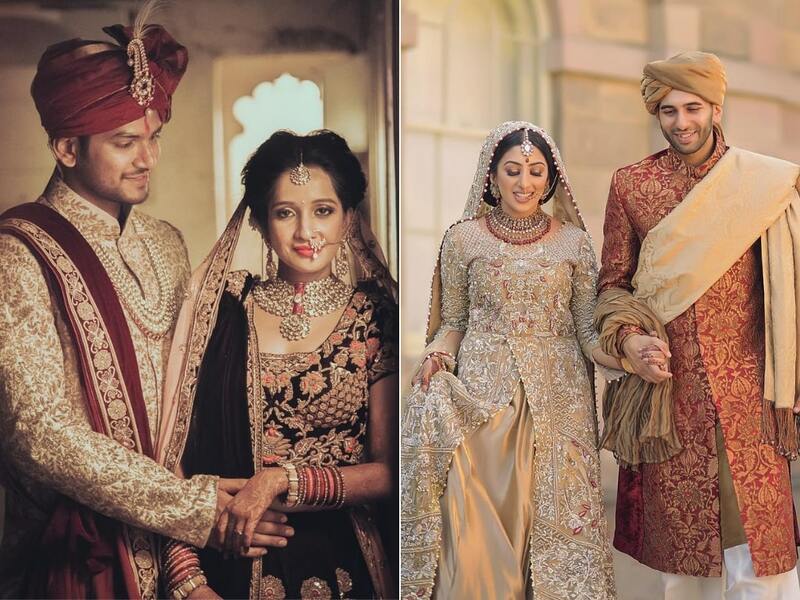 It is also a tried and proven way to make sure that it shows that the bride and groom made an effort to look like they belong together, which promotes made for each other vibes in the ceremony. 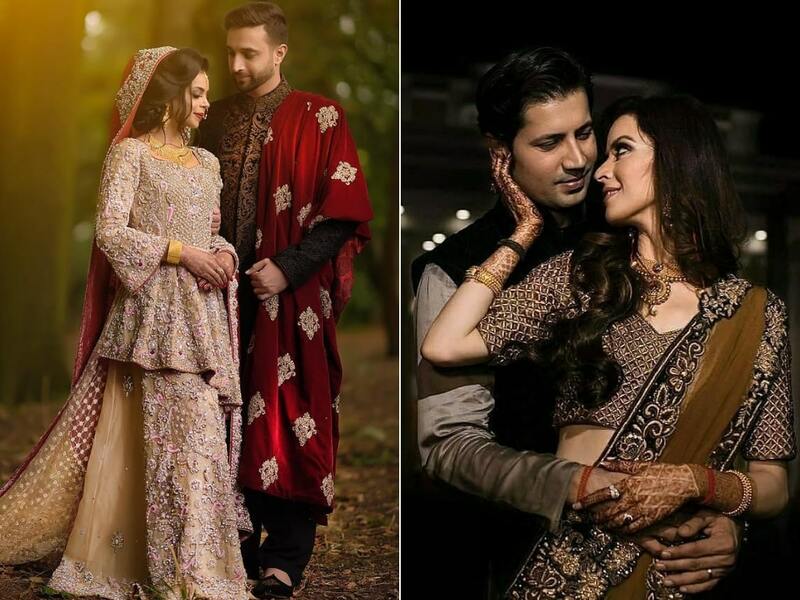 You will see how fun it is to experiment with colors and make sure that your better half has the same shade as you on the greatest day of your lives. You can complement each other’s dress by wearing accents of the same color in lighter and darker tones. If the bride is wearing a pale pink, the groom can wear darker, reddish pink (the watermelon hue). 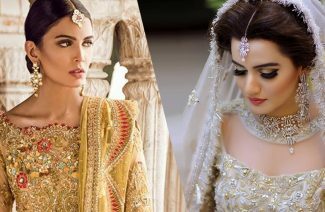 It’s a popular trend that has been taking over the Indian bridal scene. The grooms are trying all sorts of unprecedented colors that we have to say, look quite gorgeous. Some colors that can work great for same color shade families are peach, pink, blue, purple etc. You will see that it plays out nicely like your outfits are flirting with each other. Another fun trend that we have witnessed is that grooms are coordinating their waistcoats with bridal skirts. The motifs and the patterns don’t have to be the same, but the color needs to be same. 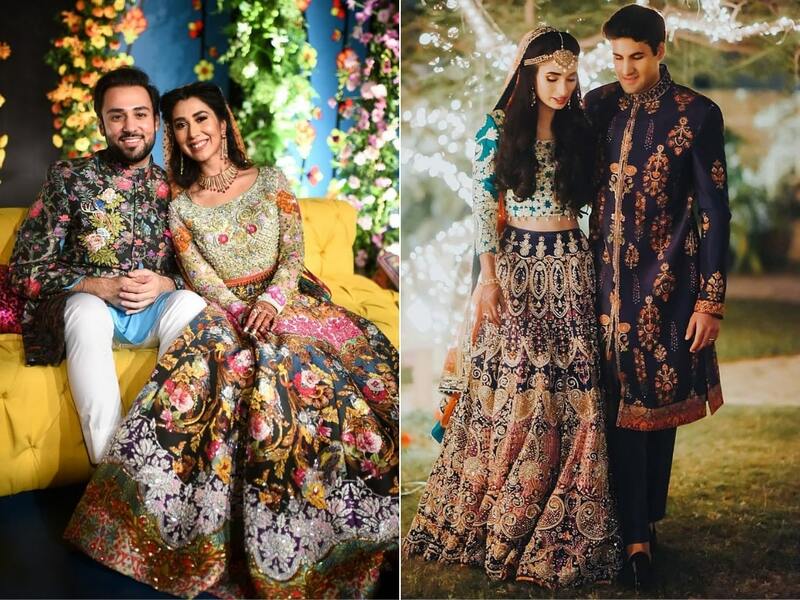 It’s an easy trend to hop on to, if your bride intends to wear something full of colors. Especially for Mehendi events. It looks great fun and offers a sense of belonging, which as we have already discussed, is the essence of the matching outfits. Modern fashion with their designer and their hip outfits offer you the chance to make sure that the world knows who you belong to, just at a single glance. There are some colors that belong together. They might not be the same family, but they surely give out a paired effect like pale blue and baby pink. These colors are paired so often that onlooker immediately places them together. We have added some such combinations below that you can try to maximize the visual effect upon your grand entrance. 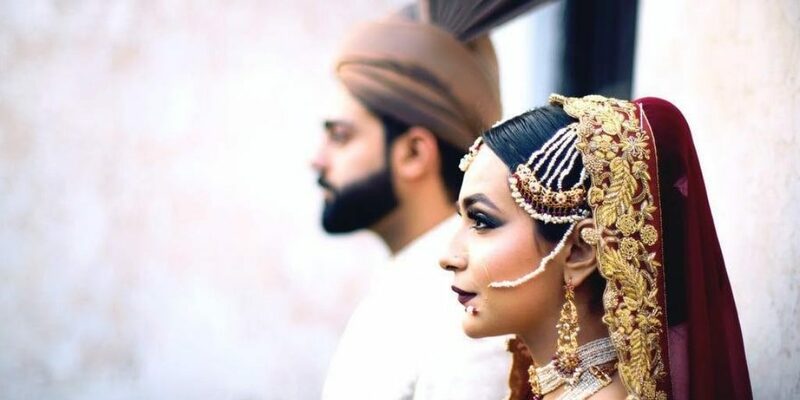 Another unorthodox option of coordinating your outfit is that the bride and groom can wear jewelry that matches their spouse’s dress rather than their own. This trend looks great in couple’s photoshoot. Your jewelry has to look in harmony with your dress, but match the color of your better half’s outfit. 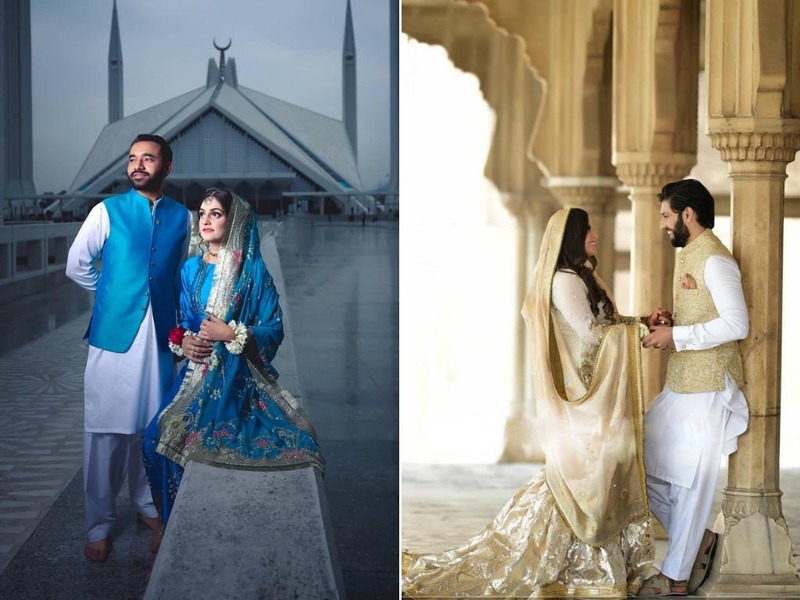 Some couples are trying to have the same motif and embroidery on the both outfits. There are many ways to add a similar touch to your outfits on a big day, but it all comes down to your personal preferences. Which options are you considering for the wedding? Wearing the same wedding outfits means you will stand out in the crowd together. 5 Ways to Coordinate Your Wedding Outfits with Your Spouse.